TRACC Borneo Volunteers: Where are the Creatures? - Blast Fishing and Coral Collecting. Where are the Creatures? - Blast Fishing and Coral Collecting. “Lonely reef”, has become an aptly named dark premonition of the effects of blast fishing on our coral reefs and ocean, and an all too easy place to gather coral. As we descend below the surface on our coral-collecting mission the reef is illuminated with the pinks, yellows, browns, greens, purples, and oranges of coral softly swaying and spiraling towards the light. 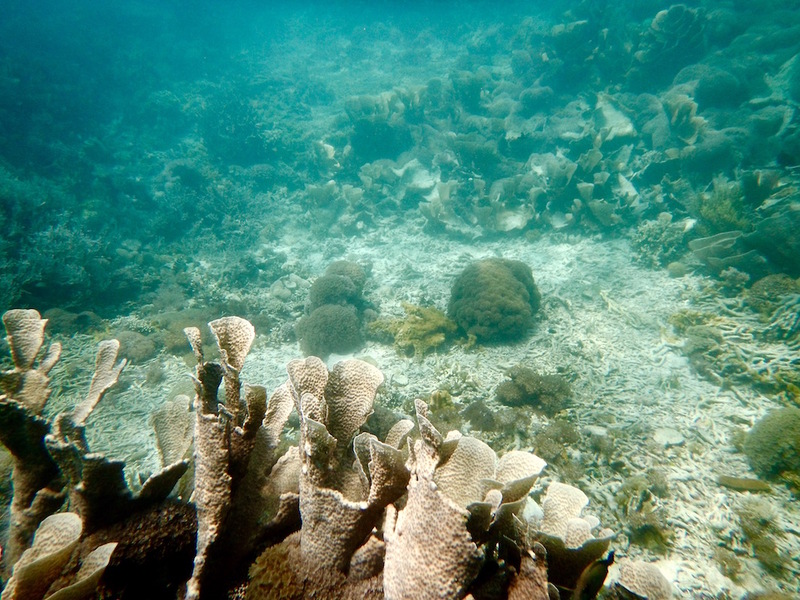 With such bountiful coral I cannot help but think where are the fish? 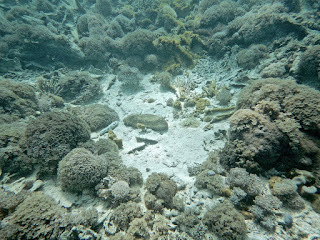 And then the craters of dead coral appear and the very real destruction of blast fishing is imprinted in my mind. 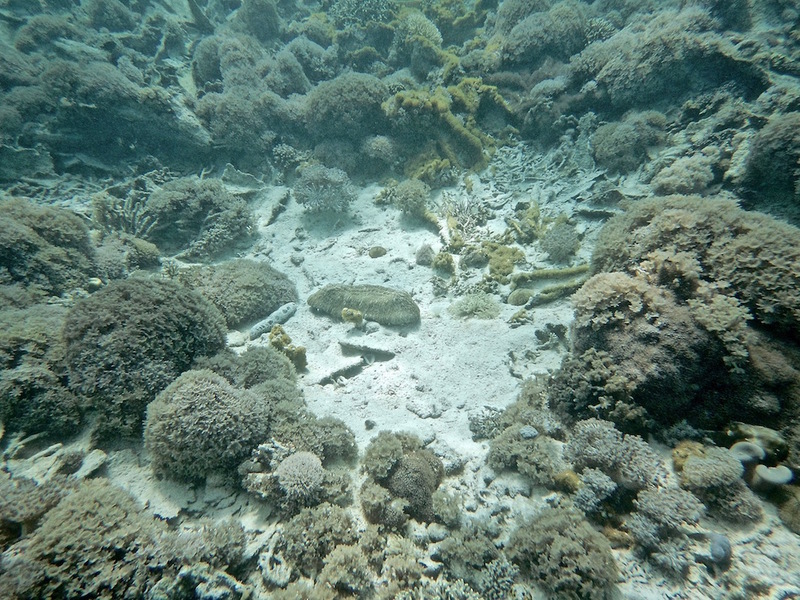 Creatures and coral are absent not only in the crater of destruction that result from the ecological disaster of blast fishing, but throughout the whole huge coral reef. The coral garden that should be teeming with life is absent of all but a few very small fish and black spiky and sparkling sea urchins. Why? Blast fishing, also called bomb of dynamite fishing, sends an average shockwave from one bomb that kills all coral and life within 2.5 meters of a the site of detonation. Yet, its apocalyptic shockwaves spread 100 kilometers in every direction like a target of doom. This shockwaves kills most fish within a 25-meter sphere. The target of this destructive action is often fusiliers, because they are both the fish that is left after everything else has been caught, and are nearly impossible to catch in every other way. The dead fish float to the surface and are easily collected by the blast fishermen. We ascend from the reef and the all too easily salvaged broken corals are brought onto the boat to be planted on the bottle reefs TRACC has built. But the awful surreally and discomfort of experiencing something that is just not right pervade through our boat ride back to Pom Pom. Bewildered by the destruction I ask myself what can we do? Be a careful consumer - don’t buy dried fish in Malaysia, which are more often than not the product of blast fishing. When buying fish from the market, aim for small pelagic fish that look like a small tuna - blue on the top white underneath, because large numbers of these fish that weigh about ½ kilo in the markets are a sign of a healthy population. Make a statement by walking out of restaurants – if you see a restaurant that is selling something it shouldn’t, shark fin soup, endangered wrasse, giant clams or anything else that just shouldn’t be there, order your meal, wait a few minutes, ask to look at the menu again, and tell the waiter/waitress/owner/manager you can not eat there and why, and walk out without paying for or eating your food. Take pictures if you can and then put it on trip advisor and social media with a very negative review in as many languages as possible. And of course, spread the word and the knowledge about blast fishing and the little ways you can help our earth everyday.